Thai Green Curry with Seafood | Simple. Tasty. Good. Here in my local supermarket in Spain I can easily find these fresh seafood and fish platters for 4 to make a classic paella with. 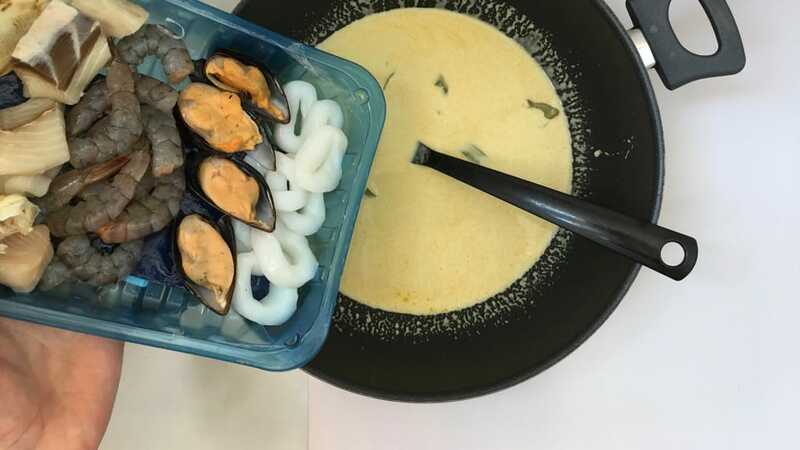 But because I’m not too fond of that, I kept these treats in the back of my mind for a totally different recipe: a creamy Thai green curry with seafood!! It is hard to buy this lovely variety of seafood and fish separately: well I guess my fishmonger would kick me out if I asked for 4 mussels, 6 calamari rings and stuff. And there’s always the frozen seafood mixes in the freezer department but then most are already pre cooked so… meh, too chewy. See why I love these fresh paella mixes? 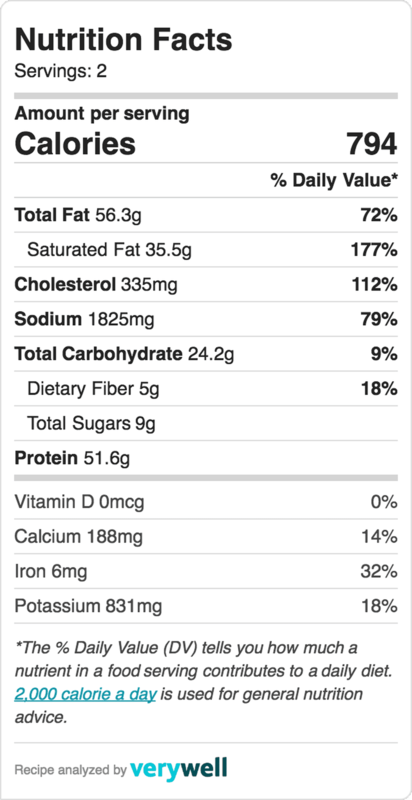 I also added crab claws to the seafood mix because I can buy those separately. We both loved this curry and it’s so easy peasy to make. I usually make chicken or beef curries but this Thai green curry with seafood will be often on our menu from now on, I can feel it! I used a spicy green curry paste but the yellow or red one are also perfect for this curry recipe! 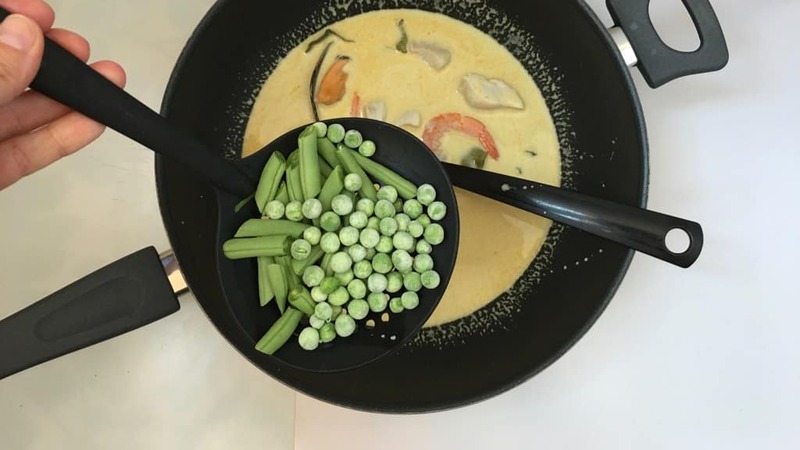 For the KitchenAid Cook Processor recipe of this Thai green curry with seafood: scroll down to the second recipe here on this page! 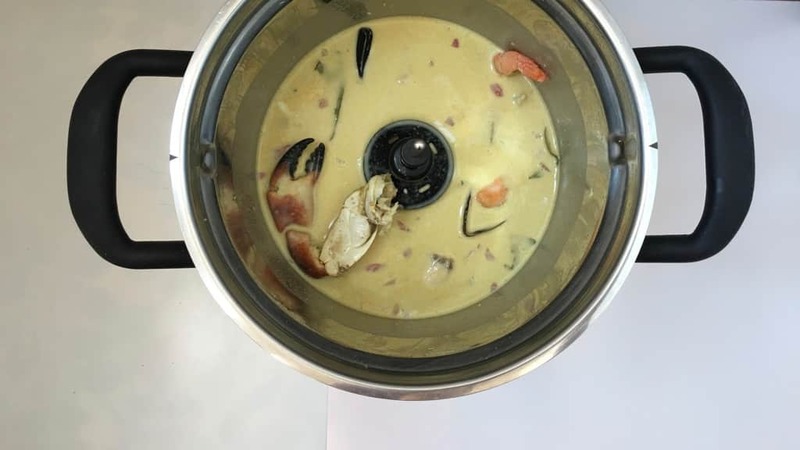 A super creamy Thai green curry with seafood: a bunch of prawns, fish, calamari, mussels and crab... awesome Thai dinner! 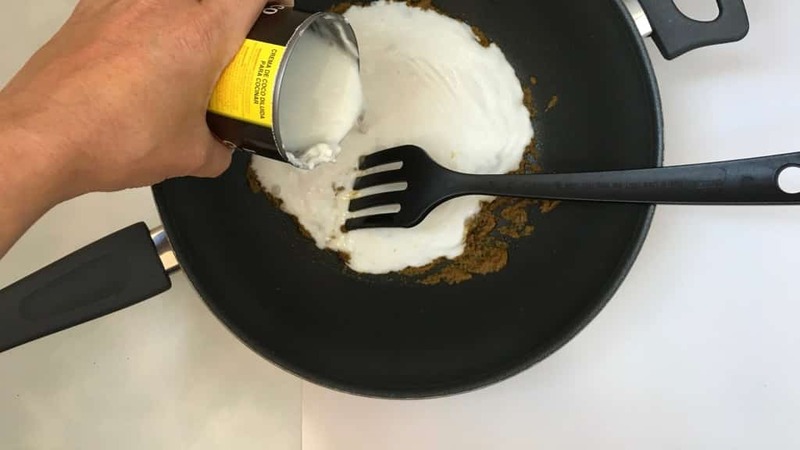 Pour the vegetable oil in a large wok or large non-stick pan and place it over high heat until hot, then add the curry paste. Stir fry the curry paste for about 2 minutes. Then turn the heat lower to medium. Pour in the coconut milk. Then add the grated ginger, chopped shallot, the sugar, fish sauce, kaffir lime leaves (optional) and the fish bouillon cube. Stir well and let the coconut cook for 8 to 10 minutes. Then add the fish and seafood to the hot green curry. Turn the heat lower again and simmer the seafood and fish for 3 minutes. Then add the frozen peas and green beans. Cook the curry for another 3 to 4 minutes. Then check the seasoning and add extra fish sauce or sugar to taste if necessary. 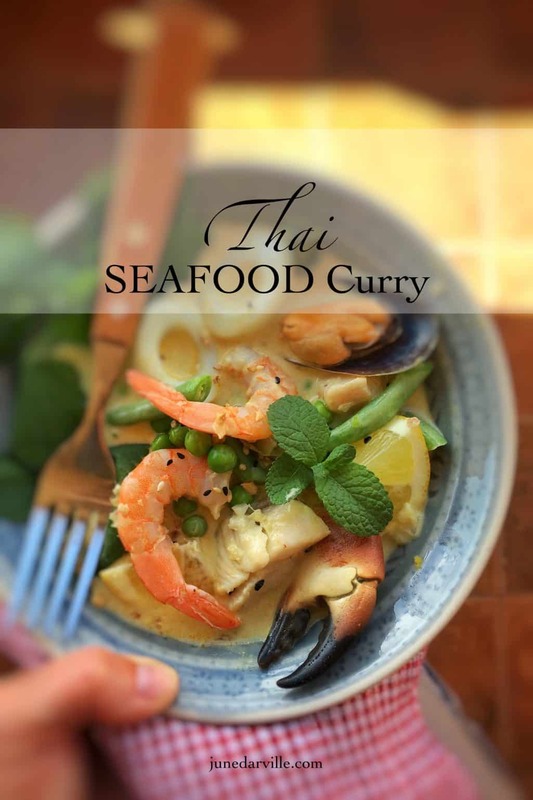 Divide the seafood and fish over deep plates and drizzle with the green curry sauce. Serve hot. I used a spicy green curry paste but the yellow or red one are also perfect for this curry recipe. 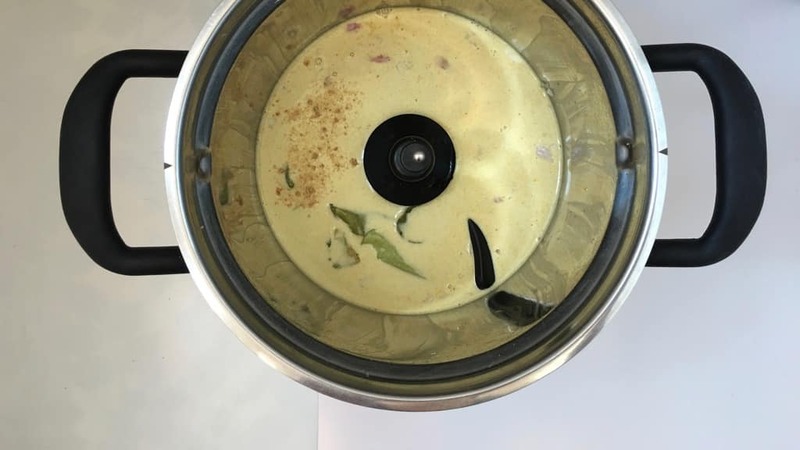 As you can see, I also prepared this Thai green curry with seafood and fish in my KitchenAid Cook Processor, magnificent! 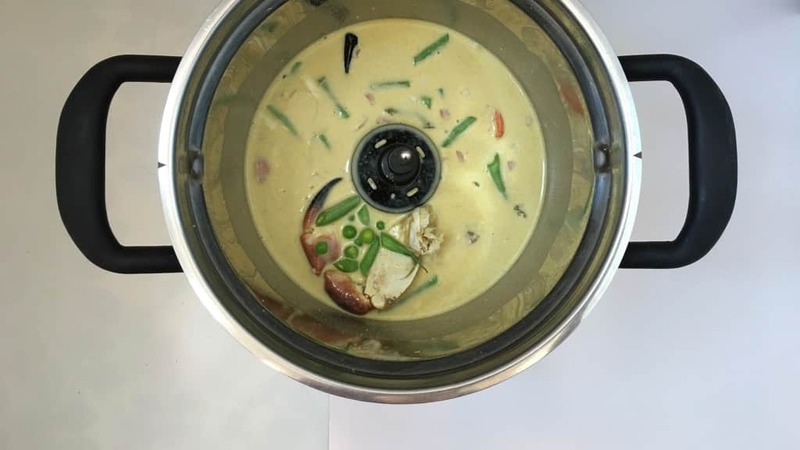 Creamy Thai seafood curry with prawns, fish, calamari, mussels and crab... straight from my KitchenAid Cook Processor! 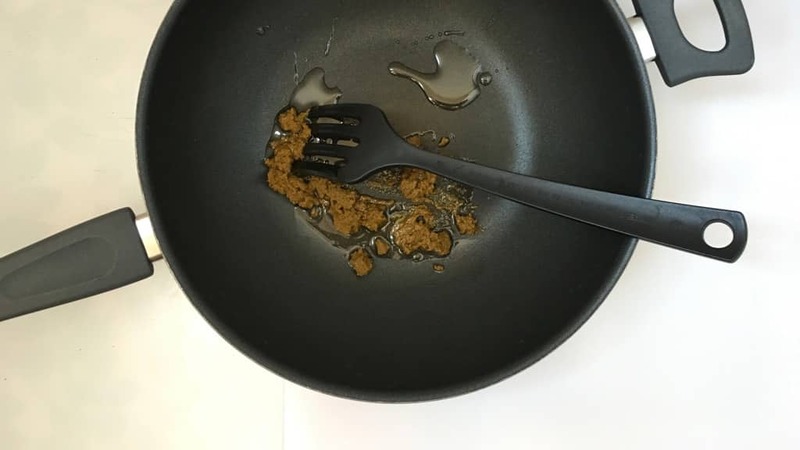 Place the MultiBlade in the bowl. Add the peeled ginger and the shallot. Then close the lid and press Pulse for 10 seconds. 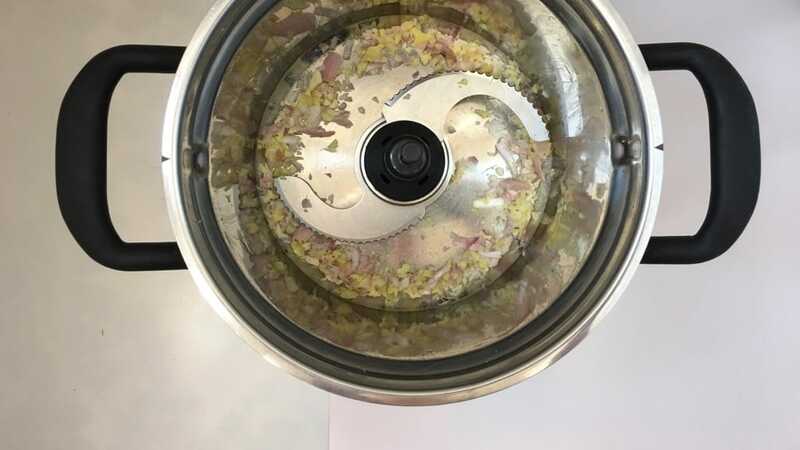 Open and scrape down the sides of the bowl. Remove the MultiBlade and add the StirAssist instead. 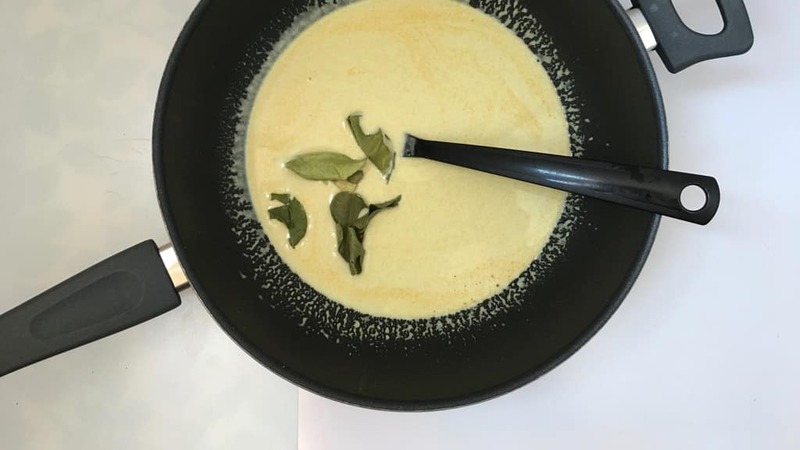 Pour the coconut milk into the bowl and add the green curry paste, the dried kaffir leaves (optional), the sugar, fish sauce and the fish bouillon. Close the lid and select STEW 11. Press Start, Step 1 shows and then press Start again to activate the program. After that, add the fish and seafood to the hot coconut curry. Adjust the timer of Step 2 from 15 minutes to 5 minutes. Press Start again. Once that is finished, set the time of the keep warm mode at 10 minutes and add the frozen peas and green beans. Press Quick Stir for 3 seconds and close the lid. Let the vegetables warm through. 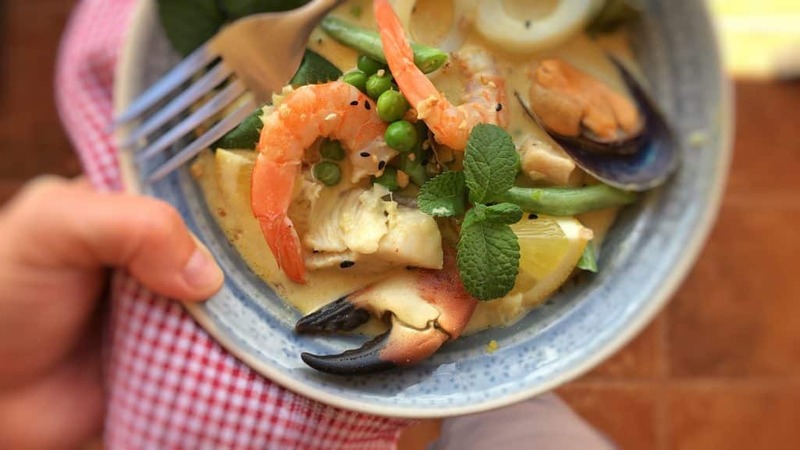 Divide the seafood and fish over deep plates and drizzle with the green curry sauce. Serve hot.